Today, all he saw was love and compassion, as thousands gathered in Hagley Park - and millions stopped around New Zealand and the world - to honour the 50 killed at the two Christchurch mosques on March 15. 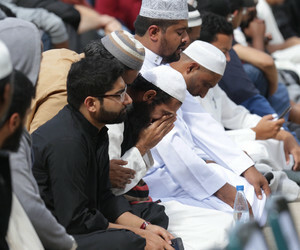 The Muslim call to prayer was spoken at 1.30pm followed by two minutes' silence to honour the victims of the shootings at the Al Noor mosque in Deans Ave and one in Linwood Ave.
Prime Minister Jacinda Ardern and thousands of others congregated in Hagley Park opposite the Al Noor mosque to observe the call to prayer at 1.30pm. The victims, of Muslim religion, died in the terrorist attack perpetrated by one accused gunman, and 48 were wounded - some critically - including a 4-year-old girl who is still fighting for her life a week on. 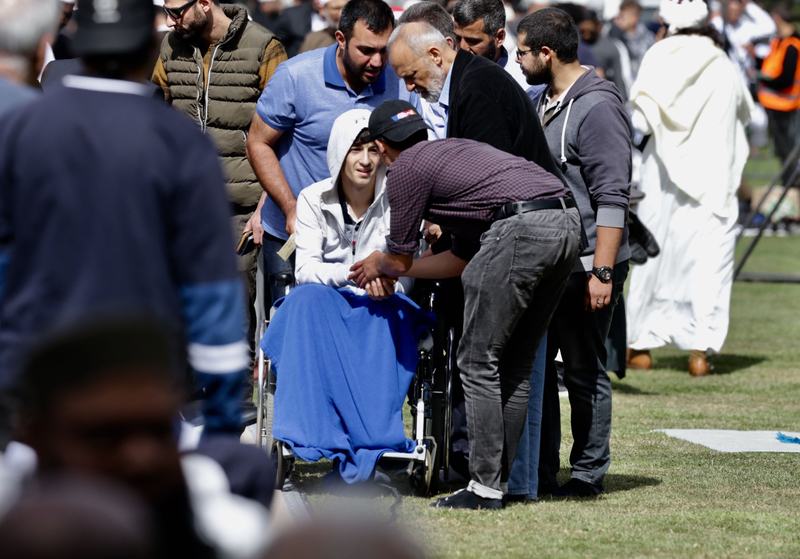 At Hagley Park the Al Noor mosque's imam, Gamal Fouda, thanked New Zealanders for their support. "This terrorist sought to tear our nation apart with an evil ideology. ... But, instead, we have shown that New Zealand is unbreakable. “To the people of New Zealand, thank you. Thank you for your tears, thank you for your haka, thank you for your flowers, thank you for your love and your compassion. "Last Friday I stood in this mosque and saw hatred and rage in the eyes of the terrorist who killed 50 people, wounded 48 and broke the hearts of millions around the world," he said. "Today from the same place I look out and I see the love and compassion in the eyes of thousands of fellow New Zealanders and human beings from across the globe who fill the hearts of millions warm." In Dunedin, people gathered at the Al Huda mosque to pay their respects, including a karakia and a haka. Fouda thanked the New Zealand Government and everyone who had shown "that Muslims matter". He also thanked first responders who helped save lives and neighbours and people driving past to save people from the killer. He also had special word for Prime Minister Adern. After the gathering in Hagley Park, thousands of people attended a mass funeral to bury 26 of the victims, including the youngest, Mucaad Ibrahim (3). A national memorial would take place next week. Ardern earlier said New Zealanders were encouraged to join in wherever they were. "Everyone should do what feels right for them, wherever they are - at home, at work, at school." Fahim Imam returned to his hometown for today's service. He left Christchurch three years ago and now lives in Auckland. "It's just amazing to see how the country and the community have come together - blows my mind, actually," Imam (33) told AP. When he got off the plane on Friday morning, he saw someone holding a sign that said "jenaza," denoting Muslim funeral prayer. Others were offering free rides to and from the prayer service. Ismat Fatimah (46) said it was sad to look at the Al Noor mosque, which was still surrounded by construction barricades, armed police and a huge mound of flowers and messages. Erum Hafeez (18) said she felt comforted by the overwhelming response from New Zealanders: "We are embraced by the community of New Zealand, we are not left behind and alone." Workers have been toiling feverishly to repair the destruction at Al Noor mosque, some of whom offered their services for free. 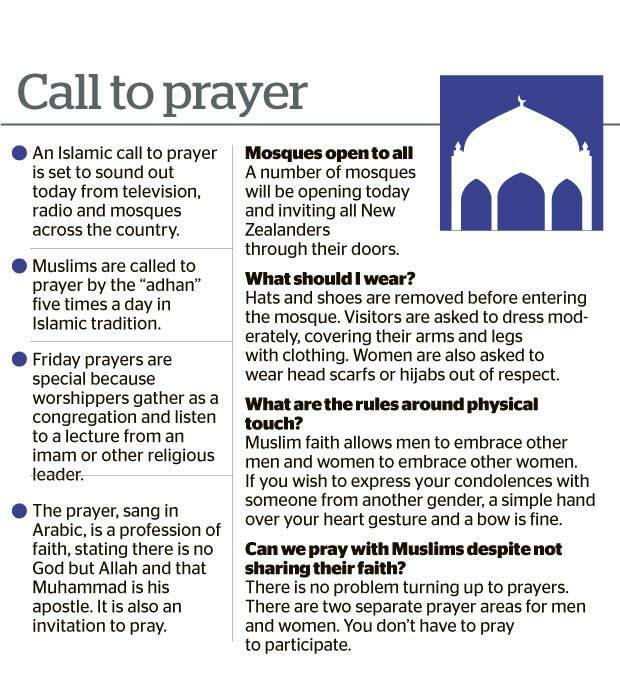 It's expected the mosque will reopen by next week. Around the country today, tributes were being paid at events and vigils as New Zealand's unity continues to shine through the tragedy. 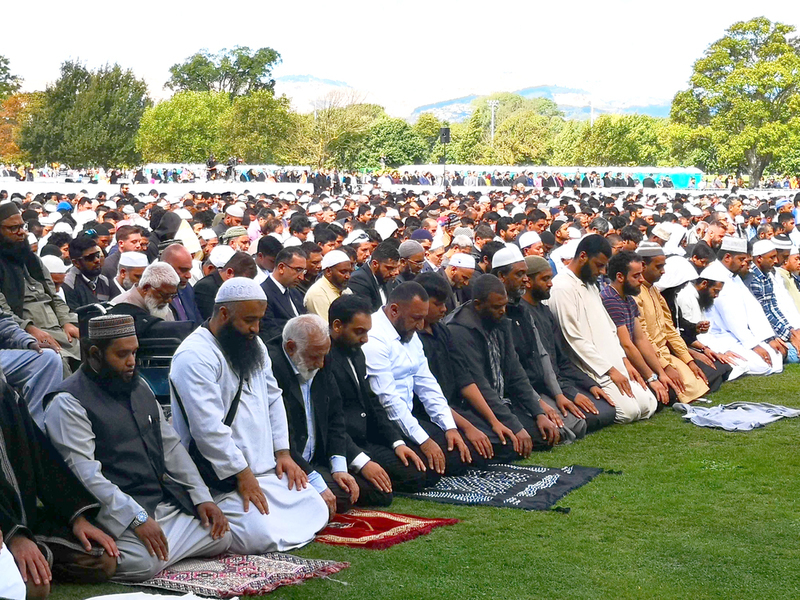 More than 10,000 people were expected at the Auckland Domain for the Jummah Rememberance Vigil, starting at 6pm. 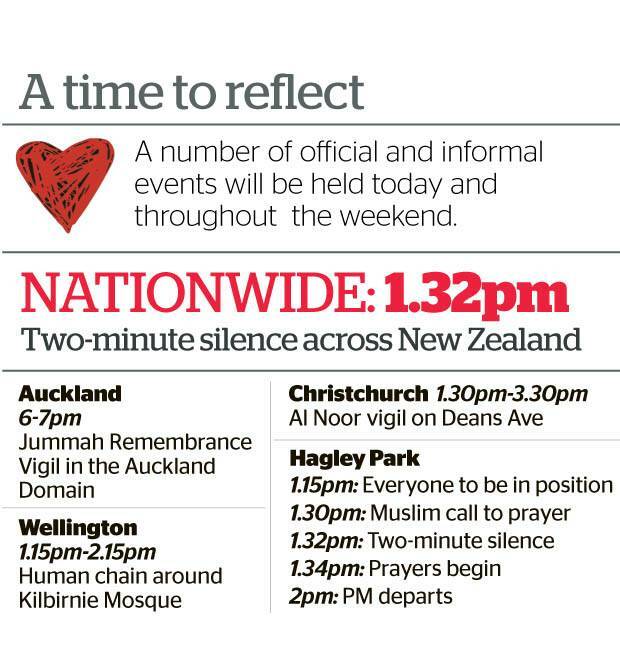 From 1.15pm at the Kilbirnie Mosque in Wellington, a human chain will be formed. There will be vigils in Geraldine, Nelson, Kapiti, Gisborne and Hamilton. • The events in Christchurch are distressing. If you, or someone you know, needs mental wellbeing support or advice then call or text 1737 anytime, or visit health.govt.nz.